Introduced by Bulgari in 2012, the sculptural Octo case has been used for a variety of watch models. The latest ones are the Octo Mono-Rétrograde and the Octo Bi-Rétrograde. In these new timepieces, the complex case, defined by 110 facets, has a diameter of 38 mm and frames black lacquered dials with retrograde displays. 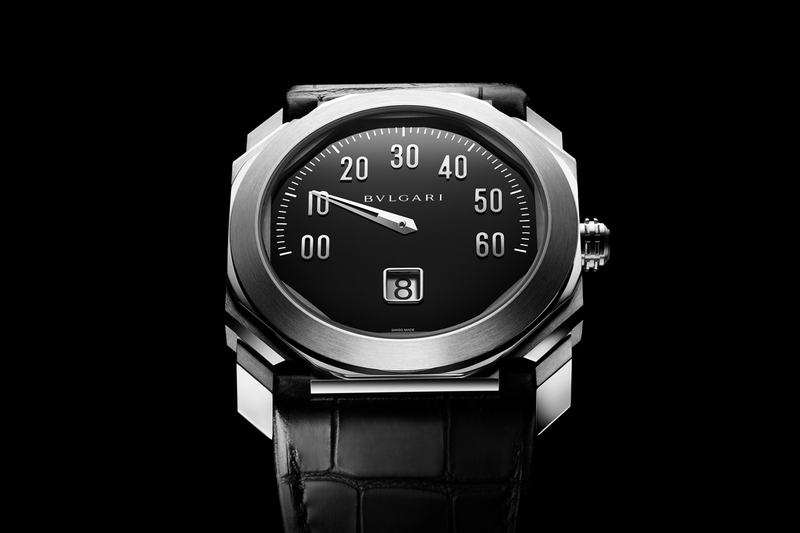 In the Octo Mono-Rétrograde version, the minutes are indicated by a hand running over a 210-degree segment and coupled to a jumping hour aperture positioned at 6 o'clock. The Octo Bi-Rétrograde adopts similar design codes but adds a retrograde date indication in the lower part of the dial and moves the jumping hour aperture at 12 o’clock. The Octo Mono-Rétrograde is driven by the BVL 262 calibre, the Octo Bi-Rétrograde by the BVL 300. 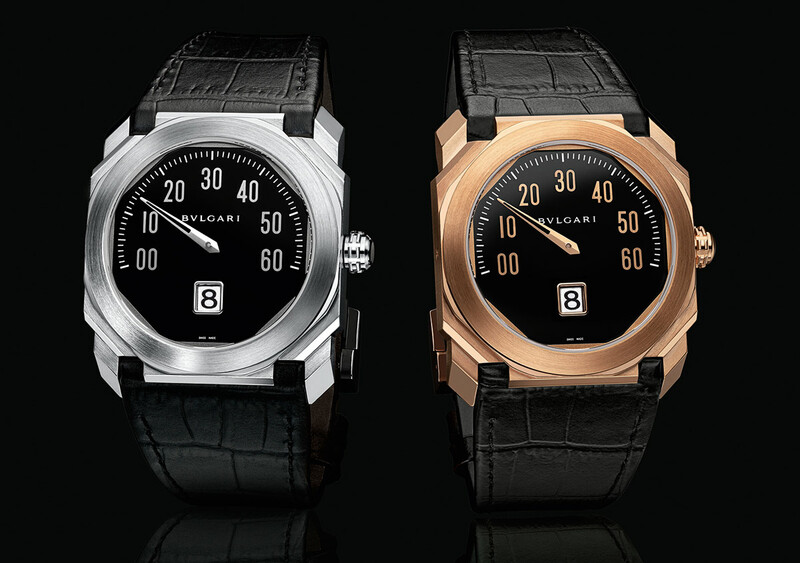 Both movements are in-house manufactured and based on Bulgari's proprietary self-winding BVL 191 calibre. 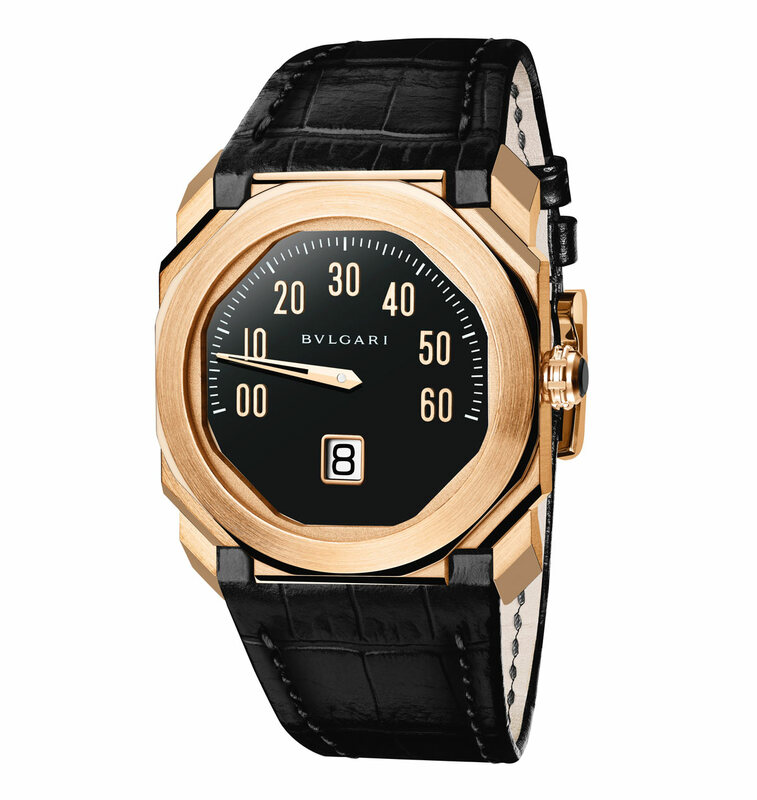 Decorated with Côtes de Genève, chamfering and snailed finishing, they beats at 28,800 vph with a 42-hour power reserve. The two models are water resistant to 100 metres and come in a choice of stainless steel or pink gold, fitted with an alligator leather strap. 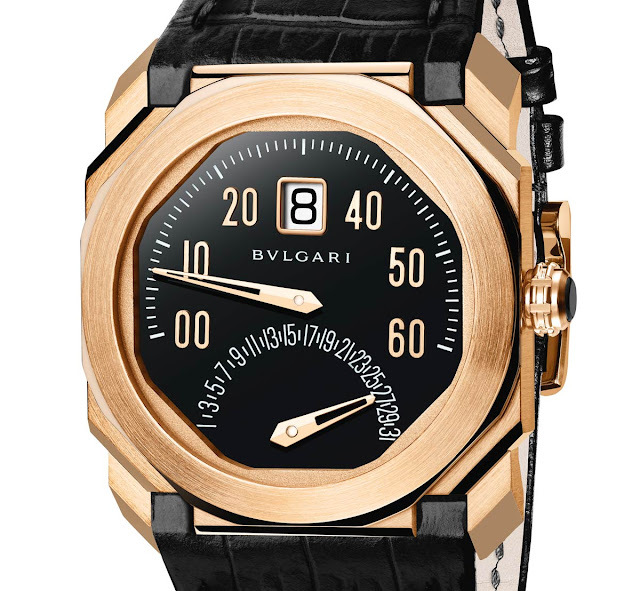 The Bulgari Octo Mono-Retrograde has a price of around Euro 14,900 / US$ 15,800 in stainless steel or Euro 29,900 / US$ 31,700 in pink gold. 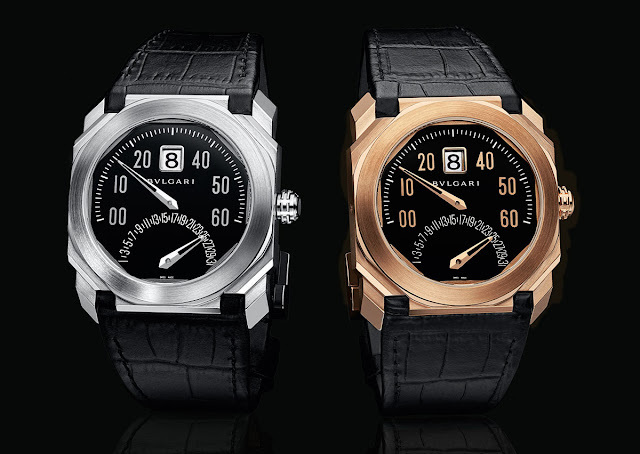 Bulgari Octo Mono-Retrograde and Octo Bi-Retrograde. 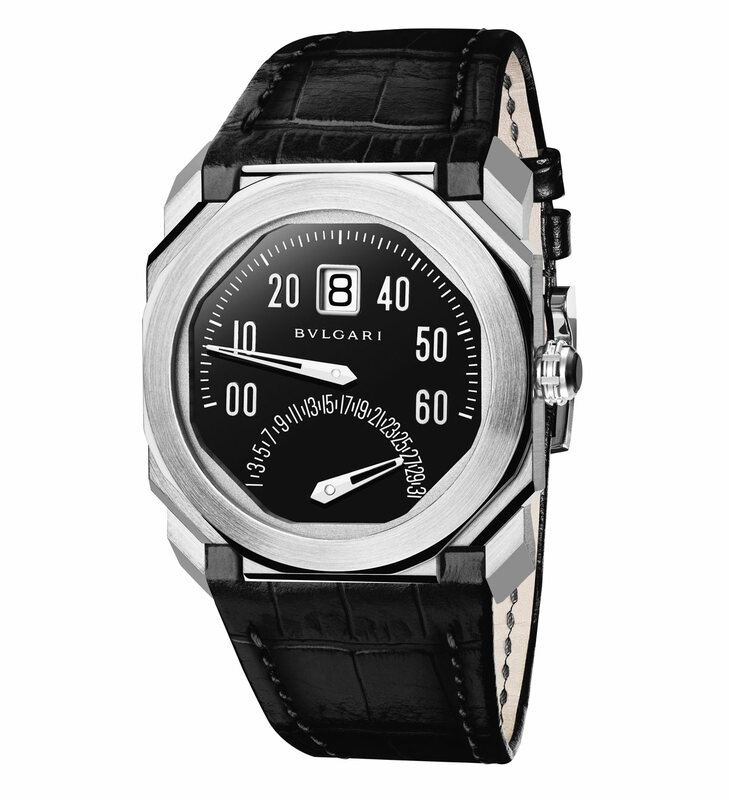 Introduced by Bulgari in 2012, the sculptural Octo case has been used for a variety of watch models. The latest ones are the Octo Mono-Rétrograde and the Octo Bi-Rétrograde. In these new timepieces, the complex case defined by 110 facets has a diameter of 38 mm and frames black lacquered dials with retrograde displays. The Bulgari Octo Mono-Retrograde has a price of around Euro 14,900 / US$ 15,800 in stainless steel or Euro 29,900 / US$ 31,700 in pink gold. The Bulgari Octo Bi-Retrograde has a price of around Euro 15,900 / US$ 16,800 in stainless steel or Euro 32,900 / US$ 34,900 in pink gold.